(W) Mark Kidwell (A/CA) Nat Jones, Jay Fotos. Saigon is in flames. Private Kuen Yam is alone and screaming. A handful of human survivors maintains a weakening hold on the only gateway to the skies and escape from Vietnam...and the muddy waters of the Mekong Delta churn like a hellish river Styx as the bloated dead rise from the depths. Few will survive the nightmares of 1968...and those who do...will bear its mark. Join creators Mark Kidwell, Nat Jones and Jay Fotos as they return to a world of military/zombie horror in this second part of the ongoing 68 series. 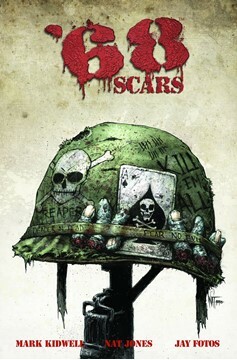 68: SCARS!.